Grades: All Middle-grade audiences, grade 8-12 Art and/or English classes. Special Equipment: An overhead projector, although a whiteboard, blackboard, and/or Flipchart are always good backups. FOR MIDDLE-GRADE AND TEEN AUDIENCES: How to Make a Graphic Novel… and Why. The presentation begins with a visual “slide-show” reading from one of the DELILAH DIRK books, projecting panels from the story one-at-a-time. Ideally, audience members and/or teachers are invited to speak the dialogue of the various characters (reading from the screen) – spoken roles include our heroine, her friend, the blustery villain, and the idiot jailor. Narration and subtext are provided by the author, who always encourages an a teacher, parent, or other authority figure to voice the idiot jailor. Once everyone’s on the same page about what kind of book this is, the author shows examples of the comics, books, and movies that inspired his work and how they all combine to make Delilah Dirk the comic that it is. He explores changing motivations, from wanting to impress girls in elementary school to later wanting to express lived truths in an accessible, exciting medium. Examples such as CALVIN & HOBBES are used to demonstrate how an easy-to-digest newspaper comic strip can communicate truth through humour. Having established why Tony makes these comics, he demonstrates how they are made. A strong emphasis is placed on the use of an iterative process (i.e., going over the same material multiple times, refining on each “lap”), constructive criticism (the notion of “individual creative genius” is nonsense, and an unbiased objective opinion is a valuable thing indeed), and the value of making mistakes and using inexpensive materials (so there’s little financial impediment to making said mistakes). Tony digs into the nitty-gritty technical details of writing, designing, planning, and drawing a graphic novel. The medium’s unique requirements are explored. The presentation is concluded by encouraging the students to do what Tony did: if they aren’t seeing what they want to see in the books they read, they can start making their own. The barriers have never been lower, the options for expressive methods have never been greater, and it’s never been easier to reach the audience that needs to hear what they have to say. As above, the presentation begins with a slide-show visual reading of a DELILAH DIRK graphic novel, again soliciting audience participation if possible. Note this is often adorable. Afterward, Tony leads the group through a character design exercise. The audience provides input as the author uses a whiteboard or poster paper to design either a hero / protagonist character or a villain / antagonist character. As he does, he proceeds through the usual trial-and-error steps he would use in any professional character-design situation. He helps the audience understand what sort of choices go into a character’s visual design: how to make them look athletic or not, noble or dastardly, young or old, friendly or aloof, and so on and so forth. Plus, the audience gets to see how a character is built up from rough, simple shapes, and what effect different details have. Tony encourages mistake-making, experimentation, observation, and asking for feedback, just as he does in the presentation for older audiences, but of course without being too scholarly about it or using the long words. He asks the audience to help determine what the character “wants,” and demonstrates how that is an important seed for a story. If time permits, Tony asks the audience to draw their own hero/villain to oppose the hero/villain the group designed together. He asks them to think about “character foil” concepts, weaknesses versus strengths, and how an antagonist might prevent a protagonist from getting what they want. If possible, he asks volunteers to present their characters to the class, and the group talks through their ideas and execution. Someone gets to keep the character designed by the group, determined using the teacher/librarian’s own discretion. 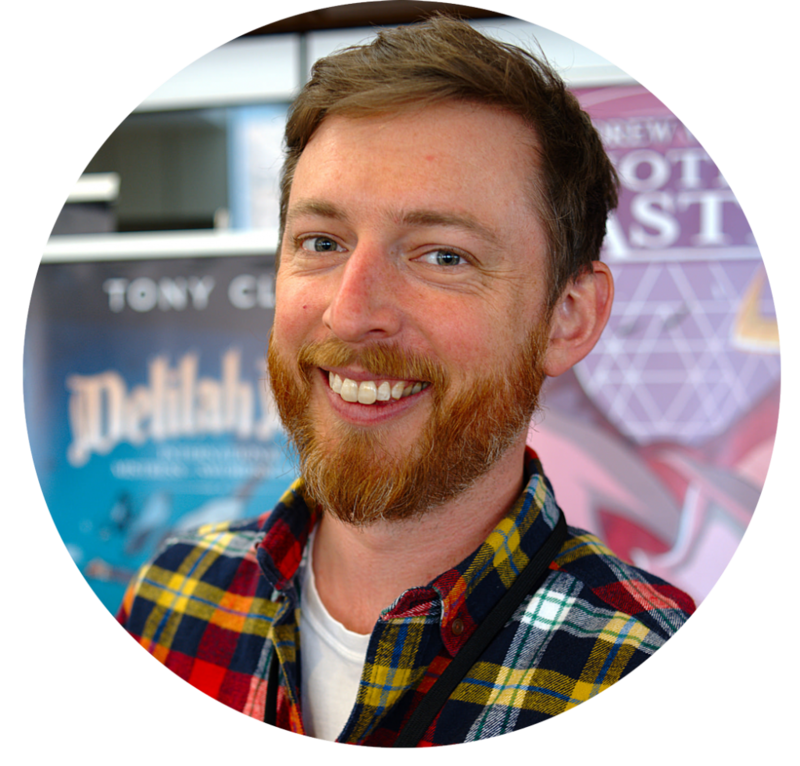 Tony Cliff is the author of DELILAH DIRK AND THE PILLARS OF HERCULES, available August 2018. It is the third in the critically-acclaimed DELILAH DIRK series of books. A New York Times Bestselling author and nominee for Shuster, Harvey, and Eisner awards, Tony was raised in and currently lives in Vancouver, BC, where he is a thirteen-year veteran of that city’s animation industry. Tony has always enjoyed making comics. Much to his mother’s delight, he would spend hours at a time sat quietly at the kitchen table doodling away at characters and their stories. Many years later, when his friend Kazu encouraged him to do the same thing in a professional capacity, he jumped at the opportunity and was rewarded with an encouraging critical reception. His very first published work was nominated for a Will Eisner award. Things have only improved. His Delilah Dirk series has received a similar warm critical reception and has been optioned for feature film production by Walt Disney features. Having grown up reading Calvin and Hobbes, The Far Side, For Better or for Worse, and later Tin Tin and the work of Mike Mignola, Tony’s own work is motivated by a desire to contribute positively to a medium that he has enjoyed so well throughout his life. He aims to combine the best aspects of newspaper cartoons, superhero comics, and “graphic novels” to create books that are exciting and viscerally engaging, but which have richer characterization and thematic substance than is typically associated with such material. He makes books for the reader he was and still is: one who wanted to see things to explode, but for a good reason. Plus, it’s a nice way to spend a few hours at a kitchen table.